BInspired by the intoxicating sounds of the legendary Master Musicians of Jakouka, this ensemble of musicians from both sides of the Atlantic – Morocco and the US - explore the potential for sound to trigger a state of ecstasy. 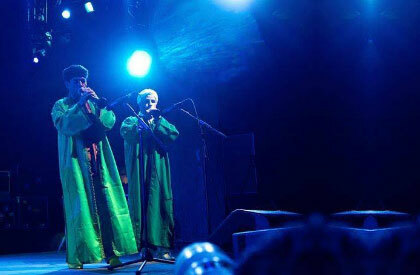 Bachir Attar is a multi-instrumentalist acknowledged for his mastery of the ghaita, a double reed oboe-like instrument that is fundamental to the sound of the Master Musicians of Jajouka, the group that he leads. His brother, Mustapha Attar, also a member of the group, plays drums as well as ghaita. Both musicians also play lira (flute). Saxophonist and clarinetist Ned Rothenberg, acclaimed throughout the world for his solo concerts and collaborations with diverse musicians, is particularly noted for his virtuosity of multiphonics and circular breathing. Arrington de Dionyso, a clarinetist, vocalist and visual artist who has collaborated recently with Bachir and Mustapha Attar, draws on a variety of traditions, including Tuvan throat singing and Indonesian trance music, for inspiration. Innovative percussionist Ben Bennett has developed a commanding synthesis of extended and traditional techniques on the drums, and worked with cutting-edge improvisers around the world. Funding is provided in part by the New York Community Trust.